Beautiful light in great detail throughout the image. Great staircase Bill looks inside my the reflection of the ceiling struts. A wonderful photo , very nicely done !! Very nice capture, well done. A fine composition! Interesting floor! Beautiful and luxury architecture! Excellent POV, my friend! Excellent shot beautiful staircase and superb details my friend. Great perspective. What a beautiful staircase Bill. Fantastic shot and beautiful staircase! Recognized the staircase as soon as it opened up large Bill had to climb it often to renew my driver’s license, what a beautiful shot of this interior a building the city has always been very proud of because of it’s status at the time it was built, thanks for sharing. A very grand staircase! Thanks for sharing the info! Wow! What a staircase. Great shot and find, Bill. My best wishes for 2016! 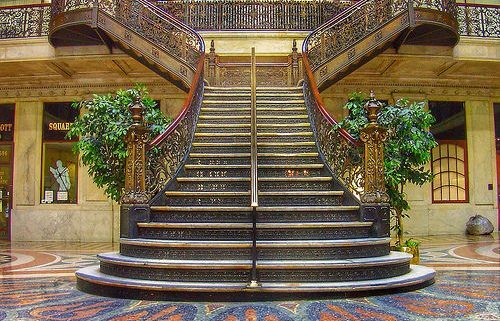 What a stunning staircase, WOW !!! Love the framing and PoV my friend, excellent capture have a great evening Bill ! I wish a fabulous Week! Stunning. Great shot Bill !!! Very nice capture and interior, Bill ! Marvelous staircase and stunning composition! 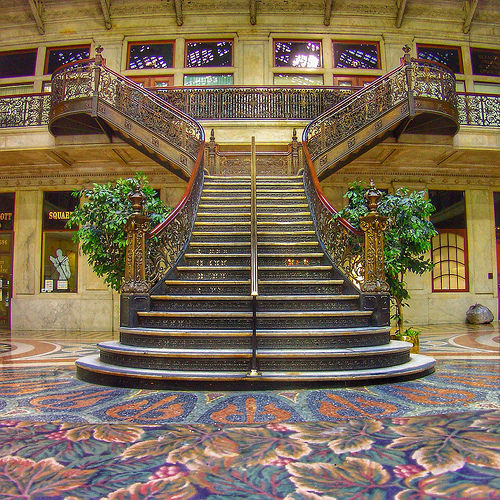 Spectacular photo, decorative staircase is so captivating. Very interesting floor decorations and other details. Keep doing splendid job of exploring historical buildings in your neighborhood state. Have a nice time Bill. It has really style, Bill! Now that is a staircase…beautiful detail and cool perspective! Wow! What a fabulous elegant composition and details! excellent perspective! Superb photo! Have a nice day, Bill! Great colors and wonderfully composed! Excellent details and nice colors. Truly a magnificent job my friend !! Wow, the steps and balustrades look beautiful, what a great perspective, Bill! Beautiful perspective and symmetry here! Awesome architecture and colours! Wow, that’s some staircase! A very imposing entrance hall. Fantastic staircase!! Gorgeous architecture! Well-captured, Bill. outstanding capture Bill as always.. joy to view your photos.. I have seen and appreciated this image from my contacts. Ho visto ed apprezzato questa immagine tra i miei contatti. Magnificent staircase and outstanding flooring! Great shot Bill of this historic building!! Lovely capture. Happy New Year to you. Wonderful architecture Lovely view !!! Very beautiful perspective and symmetry ! Wow, that is one beautiful and imposing staircase! Great staircase, wow, excellent shot and detail. Oh my God! Excellent!! congratulations!!! the balance of the framing makes the shot looks great! well done! Have a good night my friend! that’s artistic work … love the shape of the stairs ! Sencillamente magnífica,no puede ser más bella,perfecta simetria amigo,es un regalo para la vista. Un abrazo a la distancia Onasill. Wonderful colours, great interior and amazing symmetry, Bill!! !